Is there a chess book that has had a profound influence on you? "Countless. But in recent times Positional Decision Making by Gelfand was very enjoyable." "I like Rubinstein and Gelfand and found the book classy!" 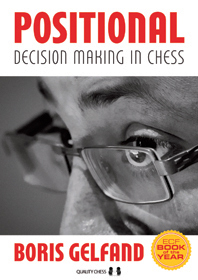 "Positional Decision Making is the best chess book I have read." There are many original and perceptive observations sprinkled throughout this book... This is must reading for any serious chess player. My strongest recommendation without reservation"
"The book is really powerful, with a lot in there. As a top player Gelfand has no problems recognising the most important things, while Aagaard explains them skilfully. I would count the book as required reading."